Cargo shipments arrive at their destinations on-time, intact, every time. We offer a full range of Hawaii, Guam and global sea freight delivery services at very competitive rates to fit our customers’ budgets. Get a quote today and compare our rates! We have exclusive arrangements with premier intermodal and transcontinental trucking lines to provide tailored, timely transportation within the continental United States. We can arrange the appropriate equipment depending on your needs. Also available are weekend deliveries and scheduled before-and-after-hour mall retail deliveries complete with scanning/automation. As a world-class freight forwarder, we are ISO 9001 certified, C-TPAT validated and NVOCC licensed. Our assembly and consolidation service provides you with all you need to prepare your shipments for Domestic or International ocean or air service. Our extensive trucking and CFS networks provide timely pick up of all shipments and ensure that we can respond to last minute requests and unexpected emergencies. Comprehensive reports provide shipment details including your purchase order number and pallet count, and can also be automatically emailed to you on a daily basis. Scanning of goods/cartons/packages/small packages can be done upon both receipt and delivery of your merchandise, providing you with up-to-date status and real-time information. We also ship to other Pacific Rim and Latin America points (quoted upon request). With our own DGX offices in numerous trade lanes, along with experienced Partners in all trade lanes, we remain on the cutting edge of our industry. 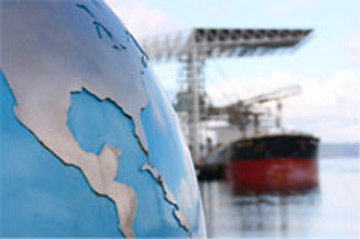 We service imports and provide customs brokerage services. We are C-TPAT Validated and Customs Brokers, and can provide a complete service from Origin to Destination. Want information fast? You can use our convenient online services to obtain a rate quote or schedule a pickup. Give us a try – you’ll be glad you did!